UND Athletic Director Brian Faison addresses the public and media on Wednesday, announcing that UND would be cutting three varsity sports at the end of the 2016-17 season to meet budget reduction mandates. Photo by Shawna Schill. The University of North Dakota Athletics Department announced on Wednesday, following the discontinuance of its men’s baseball and golf programs in the prior fiscal year, that it will discontinue its varsity women’s hockey and men’s & women’s swimming & diving programs, effective at the end of the 2016-17 academic year as part of the University’s ongoing budget restructuring efforts. The continuance of the men’s golf program is contingent upon its successful fundraising efforts. In January 2017, UND President Mark Kennedy announced that the athletics department would need to further reduce its 2017-18 budget by over $1.3 million as its contribution to the university-wide cuts being dictated by the state’s revenue shortfall. Additionally, with UND’s move to the Summit League, additional money will be needed to comply with the Summit League’s minimum scholarship requirements. UND expects that the current changes will enable it to meet those additional scholarship expenses without having to make further cuts next year. UND’s athletics department expects to reinvest any additional savings back into its women’s and men’s teams, with a primary focus on gender equity, internal equity, and championship competitiveness. 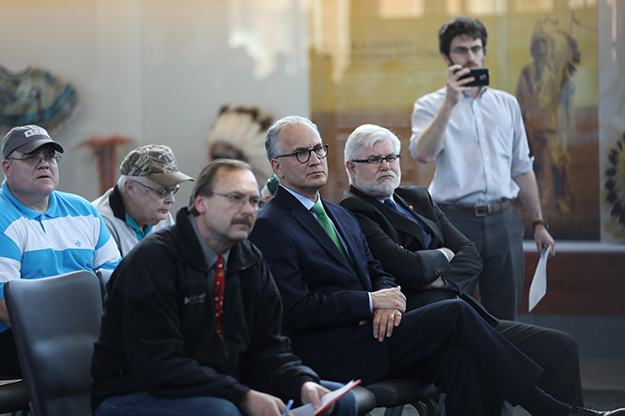 UND President Mark Kennedy and Peter Johnson, interim Vice President for Public Affairs at UND, are surrounded by member of the media and public during Wednesday’s announcement that UND would be cutting three varsity-level sports at the end of the 2016-17 season. Photo by Shawna Schill. The decision was reached based upon the University’s budget reduction instruction, conference sport sponsorship requirements for both the Big Sky Conference and Summit League, Title IX compliance, additional Summit League scholarship requirements, and the ability to reinvest in championship-level programs. The University worked with the Baker Donelson law firm as its outside legal counsel. UND will honor all athletics scholarships for discontinued sports at their present equivalencies for returning student-athletes. Specific details have been provided to the student-athletes regarding their future aid. 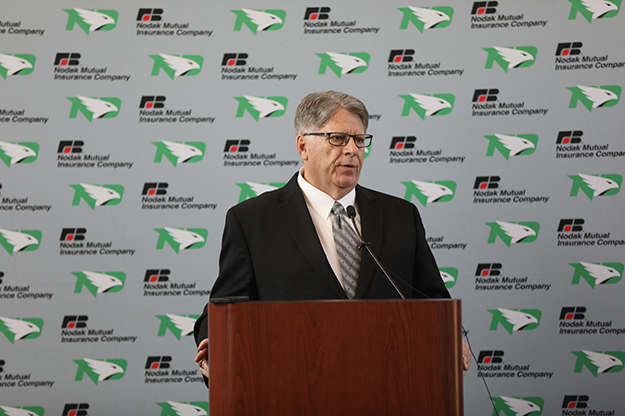 UND Athletics Director Brian Faison met with the affected coaches, staff and student-athletes on Wednesday afternoon to inform them of the decision.